in5 (InDesign to HTML5) is incredibly flexible. It’s easy to attach custom functionality to your output. I’ve shared several customizations on this blog and on the Answer Exchange. The most popular customization by far is the “desktop scaling” code that scales layouts proportionally to the browser window. In fact, when most people ask me about a “responsive” layout, they actually want to maintain their layout and simply scale it proportionally (a truly responsive layout changes at different sizes—I’m working on that, too). To make it even easier for you to create flexible layouts (on both desktop and mobile), I’ve folded this scaling feature into in5 and refined it further. 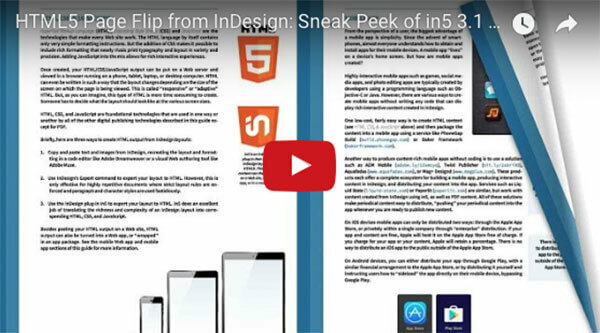 Download a copy of in5 to try out Desktop Scaling. Are you moving from print to digital? Need help exporting your spreads to HTML? 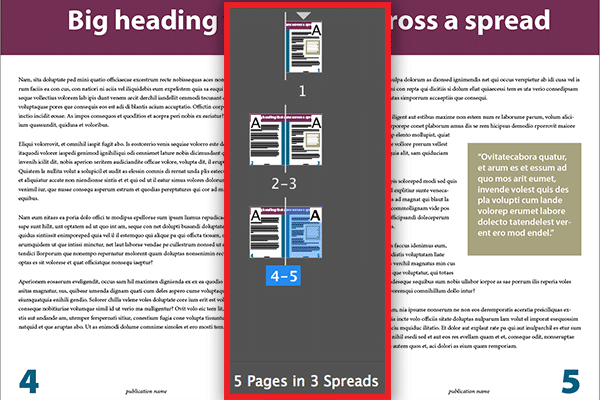 Starting with version 3.1 of in5 (InDesign to HTML5) comes with a script that lets you merge multi-page spreads into single pages. Here’s a screenshot of a document with spreads before the script has been run. To merge each spread into a page, you’ll simply run the Merge Spreads script that will be installed with in5 v3.1. The script will produce a new document (so your original is left unchanged). Note that the number of spreads and the number of pages are now the same in the image below. You can now finish prepping the modified document for a digital format (web, mobile app, etc). This is just one of the ways that in5 will help you transition from print to digital documents. 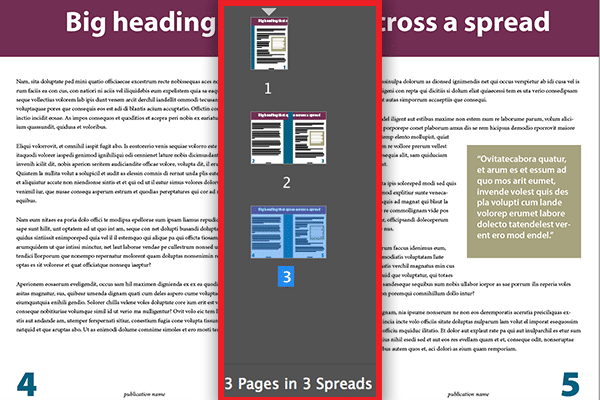 Get a free copy of in5 today to start using the Merge Spreads script. Even Photoshop doesn’t create the smallest web images possible. I typically recommend a service like TinyPNG because it can shrink your images by as much as 50% (and more in some cases). Smaller images mean faster loading and less waiting, which makes for happier readers (especially on mobile devices). But it does require adding an extra step to your workflow. With in5 (InDesign to HTML5) version 3.1, all you will have to do is check a box when you export from InDesign, and in5 will automatically optimize the images for you! See it in action in the video below. 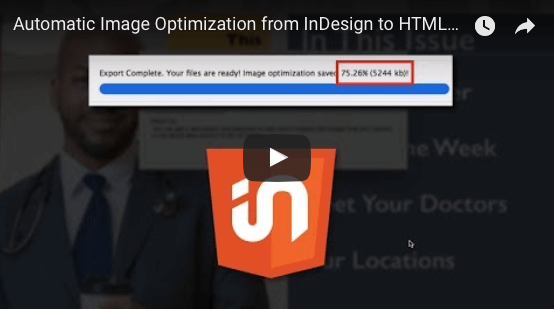 The optimization setting will compress PNGs and JPGs automatically as your HTML5 document is being published and saved to your computer. Subscribe to be notified when version 3.1 is available. 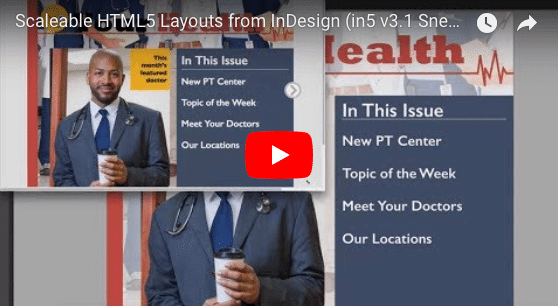 This quick video shows some of the new things you can now create with in5 (InDesign to HTML5) version 3.1. There’s a new page transition: Flipbook with Page Peel. You can see the pages (with live text, animations, and interactivity) curling and peeling in the video below. This video also shows two other highly requested features that are now available to all subscribers. Buttons that support live text and variable image quality. Source images that appear only once in the output. This will help you save file size in your output. 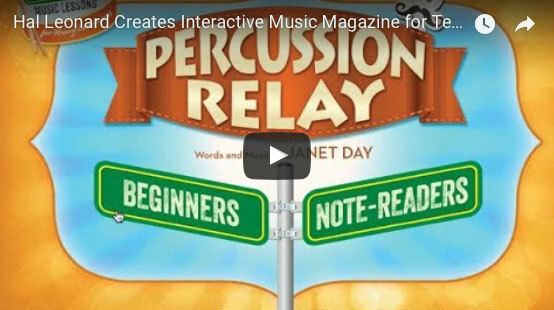 The team at Hal Leonard publishing has created an amazing digital experience for music teachers and students. Music Express magazine is in its 18th season and is available as a private download. The team shared a recent issue with me and I’ve created the video below to show you what’s inside. 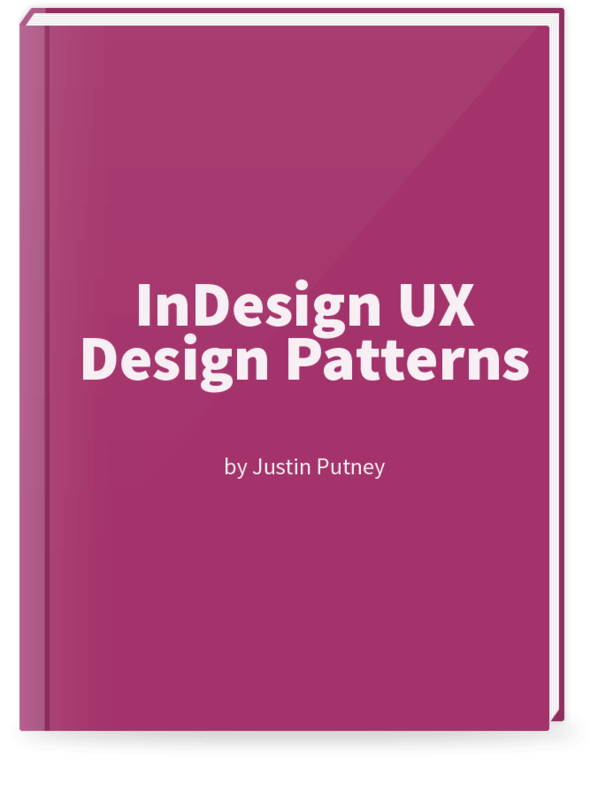 The interactivity was created visually with Adobe InDesign and exported using in5 (InDesign to HTML5). The artwork is created by 5 in-house designers and assembled into the digital format by Production Team Leader, Nicole Julius. The team started producing PDFs with limited interactivity years ago when learning management solutions started popping up in classrooms. The team bought in5 and put together a prototype of an all-inclusive digital magazine for teachers to try out. The response from the teachers was overwhelmingly positive! Now the team at Hal Leonard is producing regular digital issues. Watch the video above to see their magazine in action.